The locals call it Aldama, preferring to honor the 1810 Mexican Revolutionary War hero Juan Aldama, rather than the saint name imposed by Spanish conquerors. They are revolutionaries themselves here with most of the village sympathizing with the Zapatista movement. They are also extraordinary weavers of traditional huipiles and finely woven agave bags. The largest and finest bags take three months to make. The gala, celebratory fiesta huipil, made on the backstrap loom using supplementary weft technique to create the designs, can take eight months to weave. I’m taking our Chiapas Textile Tour travelers on an adventure. As we climb the winding mountain road, we pass through Chamula territory where women are wearing the traditional wooly black skirts and men sport wooly white tunics and white hats. At the Y in the road we divert left. To continue right would take us to Chenalho and Chalchihuitan. As we climb, the mist thickens and droplets cover the windshield of our van. We are covered as if by a shroud. This is territory where wool and heavily woven cotton offer protection from the chill. In Aldama, women become weaving masters by age twelve. Their designs are mathematic. They count the warp threads. Dream their designs. Wrestle with design problems as they sleep. Wrestle with angels. The designs talk to them through Santa Marta, Magdalena and Maria. The patterns that emerge are magical and surrealistic. Lady Xoc appears as a figure hidden in cloth, transferred from the frescoes at Yaxchilan. You see her symbol in the cloth of the three villages — San Andres Larrainzar, Aldama, and Santa Marta. Triangles represent the universe. Frogs symbolize the coming of rain. The diamond contains a sacred sense of location. Put your head through the opening of the huipil and the wearer is at the center of the universe. The symbol of the sunrise is a syncretic symbol of the birth of Jesus. Corn plants tell us the story of the dry season and also of fertility. Indigenous cultures depend on rain and sun to grown corn, squash and beans. To survive and thrive. The textiles tell us this. Other symbols are incorporated in the work we see: rabbit tracks and dog paws, foxes and butterflies. Clothing is part of the natural world. Obscure light in cooking area. Photo by Mike Schroeder. With the conquest, Dominican priests isolated each town, forcing them to dress in a way that would control their identity and their freedom of movement. We learn this from the cultural anthropologist I engage to travel with us. We learn that dress is part of cultural identity and carries with it political control. In some villages, like in Zinacantan, we find out the colors and designs can change regularly — more associated with fashion trends than with anything else. There is pride now in what people make and wear to distinguish themselves. However, young people are moving toward blue jeans and T-shirts. Women are the culture keepers. Men leave their villages to find seasonal work elsewhere, adapting their dress to the dominant culture. In Magdalena Aldama, there is a strong desire to keep the traditions and pass them along to the children. We saw ten year old girls weaving and embroidering along with their mothers, aunts and cousins. Ancient guava tree, just leafing out. Photo by Mike Schroeder. After being treated to a show and sale of their family’s work, Rosa and Cristobal invite us into their wattle and daub (mud and stick) house to sit down for lunch. There are seventeen of us. We are served delicious organic free range chicken soup, rice and steamed vegetables. The kitchen-dining area is open hearth. Wood smoke fills the air. The fire heats a huge cauldron of broth and chicken pieces. It has been cooking for days and is fork tender. Toddlers run underfoot or are slung around the backs of their mothers, held tight by a handwoven rebozo. Our eyes water. Our mouths water. Cristobal brings out the pox and we sip the corn-sugar cane distilled beverage. It reminds me of mezcal. I am grateful for the women and men who traveled with me. They were generous of heart, spirit and resources. They understood that when then made a purchase, they give support to culture, tradition and the continuation of indigenous cloth. The red flags fly from banners carried by men young and old. Their faces hidden with paisley scarves or animal masks. A dried ocelot skin hangs from a belt, connected to brass bells that jangle with each movement. Is this the man’s spirit animal? In the church courtyard there are troupes of celebrants on parade. Air is broken by the sound of cohetes, the firecrackers sent skyward to awaken the spirits. Inside the church, groups of families, kneel, keen, sit cross-legged, light red, black, yellow, white candles representing the four cardinal points. Green is the symbol of earth. Fresh pine needles on the floor are swept aside. A shaman prays with them for the family to receive extra blessing. No photos allowed or cameras of any type will be confiscated. A church official carrying a smoking copal urn perfumes the air. The smoke trails him, raises toward the pitched church room, rafters adorned with ribbon. There are no pews. The air is dense, musky, a shroud. The light is like a Rembrandt painting. Shuko is with me. She lives in Los Angeles with her family. She is originally from Japan and writes a blog, where she is sharing her experience of this day. One of us asks, Is this Catholic? No, I say. It is syncretism. A blend of the mystical and divine, the spiritual and the ancient, the Catholic evangelization of Mexico. Who are they worshipping? he says. Mother earth, the thirteen levels, life and death, something soulful and unnamed, I say. We sit in silence on sideline benches. Candle glow is the only light, other than from where the sun tries to enter the dark space where the roof meets the walls. This is a meditation. Outside, bright sun illuminates Chamulan faces. They speak Ttotzil, one of the Mayan languages of the region. Men wear white and black woven and combed sheep ponchos. Women wrap themselves in woven furry black sheep skirts. The temperature is close to 80 degrees Fahrenheit. Hot. Beyond the church is the market on the zocalo. Today it is packed with fruit, vegetables, raw meats, belts, fabrics, Western and traditional clothing, cooking stalls, people packing through narrow helter-skelter aisles that can dead-end. Children cry. Babies suckle at bare breast. Amber vendors ply their wares. The men on parade continue to process around the periphery, drink pox, blow ancient horns, beat drums, play flutes, strum guitars, connect with their identity. We buy wool chals with pompoms, clay copal incense burners, avocados, woven bags adorned with embroidery, ceramic candleholders. I am taking a list of those interested in going with me to Chiapas in 2020. Dates will be late February or early March. Let me know. Grand Master of Mexican Folk Art Cecelia Bautista Caballero is recognized for her outstanding creativity and innovation. About 30 years ago she developed a weaving technique to re-introduce the feathered plumage of Purepecha royalty into the rebozos (shawls) she makes on the back-strap loom. Our Michoacan study tour leads us to a humble home on a side street off the central plaza in the tiny village of San Mateo Ahuiran on the Purepecha Plateau. We want to meet, embrace and support this amazing, talented woman. We want to know her daughters who carry on the tradition. Three thousand threads of fine cotton make up the warp of this back-strap loom. It can take two or three months to weave the cloth, then another two months to hand-knot the elaborate fringes called the punta. We want to explore a region whose DNA is thought to originate from Siberia, when the Bering Straits were a land bridge that brought people to the shores of North America. Cecelia Bautista Caballero is a living treasure. She enters the dimly lit room with a broad smile to welcome us. She is radiant. The light follows her. A rebozo is slung over her shoulder like a backpack. It bulges like a sack of avocados. She drops it’s weight onto a small, wood table and unwraps the folds to reveal a treasure trove of rebozos she has personally woven. Despite suffering a stroke that leaves its mark on the right side of her face, Cecelia is still productive. Weaving is her life’s work, her self-expression, her passion. With pride, she tells us how she created the feathered trim in the tradition of her ancestors, using turkey, rooster and bird feathers that are either natural or dyed with local plant tints. One reason we gravitate to visiting small villages is for the satisfaction of meeting the maker and buying directly from them. We know their prices are fair and just. We know that what we buy will help them feed their families and reinvest in materials. There is something special in this exchange, more than a transaction of money for product. It is filled with appreciation and love. Even more than this, the journey feels like a pilgrimage to pay personal homage to talented people. Sometimes this journey takes hours or days. We are like explorers, uncovering the past and investing in the future. We traveled to Ahuiran from Uruapan, designated a Pueblo Magico for its outstanding national park Caputitzio, known for stunning waterfalls. This was our base for two nights as we explored the area after leaving the Monarch Butterfly sanctuaries. This brought us closer to the indigenous town of Paracho, where we watched luthiers make guitars, violins, mandolins, and other string instruments. The main street is lined with craftsmen fulfilling special orders for musicians around the world. Mexico is a true melting pot. Her people are a fusion of ethnicities, races, and cultures originating from Asia, Europe, and Africa mingling with America’s First Peoples. The Spanish brought slaves from the Philippines and China, while Portuguese traders imported forced labor from Africa to work Mexico’s sugar cane fields and cattle ranches when indigenous people couldn’t survive disease. A very important, and heretofore unacknowledged part of Mexican history, is the slave experience in Mexico and the development of communities on the Oaxaca-Guerrero coast formed by people who escaped from the Veracruz cane fields. The Museo de las Culturas Afromestizas — the Afro-Mestizo Museum — in Cuajiniculapa, Guerrero, just across the Oaxaca border, gives voice to those who helped shape Mexican identity and honors their historic role. Read here to learn more about Afro-Mexicans. Our Oaxaca Coast Textile Study Tour group stops here on our five-hour return trip to Puerto Escondido from Ometepec. Knowing all of Oaxaca and her roots is important to us. We learn about and understand the contributions of Afro-Mexicans to Mexico’s music, dance, dress, and cuisine. Read New Yorker magazine essay about Afro-Mexican life on the Costa Chica. Please send me an email if you are interested in traveling here in 2020. I will only offer this study tour if there are 6 people making a $500 reservation deposit to guarantee we will hold the trip. Likely dates are January 10-20, 2020. Meaning of the Danza de los Diablos. Read Culture Trip article about Afro-Mexican origins and pride. We also see through the dioramas and explanation from our museum guide that institutionalized slavery has left its mark on Mexico just as it has in the United States. The colonizers, be they British or Spanish, used forced human labor to advance their economic and social agendas. Hundreds of years later, isolation, poverty, lack of education and health care, has left its mark, making this region among the most impoverished in Mexico. Enslaved blacks in American South sought freedom in Mexico, perhaps a reason for the Mexican-American War? There is a movement to give Afro-Mexicans the federal recognition and support they deserve that will help improve quality of life and economic opportunity. I stepped up onto the hollow wood box to learn the dance of the region. I’m writing from Morelia, Michoacan, left my Costa Chica notebook at home, and will add the name of our thoughtful guide later. A must-read is Afro-Mexicans Exist, So We Must Stop Referring to Mexico as a Mestizo Nation by Shanna Collins. This offers important insight into how embedded African roots are in Mexican life and culture. Her argument is that the term Mestizo completely ignores how the role of slaves influenced modern Mexico. The small museum, just off coastal route MEX 200, is a testimony to the history of enslavement and courage. It opens our eyes and hearts, gives us perspective and enriches our travel experience. 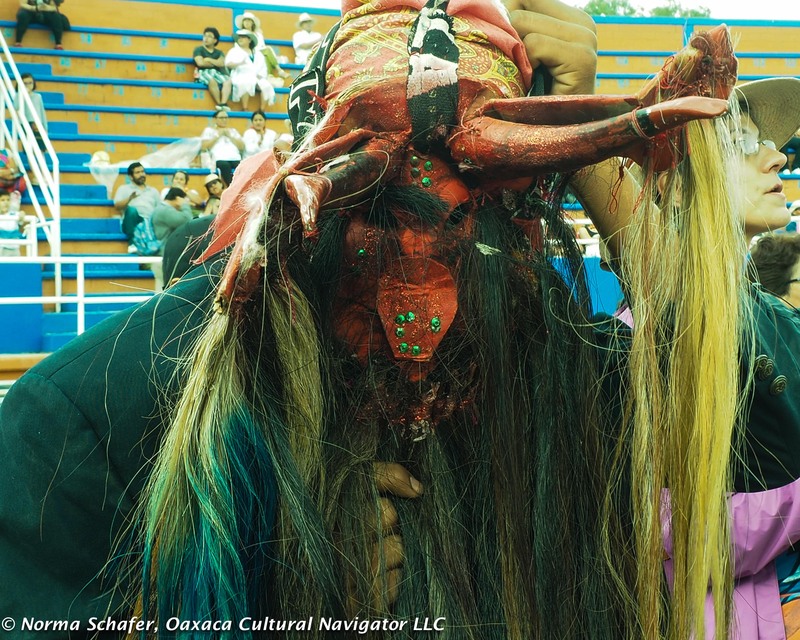 Danza de los Diablos is connected with the Afro-Mestizo history of Oaxaca’s Costa Chica, the Pacific coast region between Puerto Escondido and Acapulco, Guerrero. 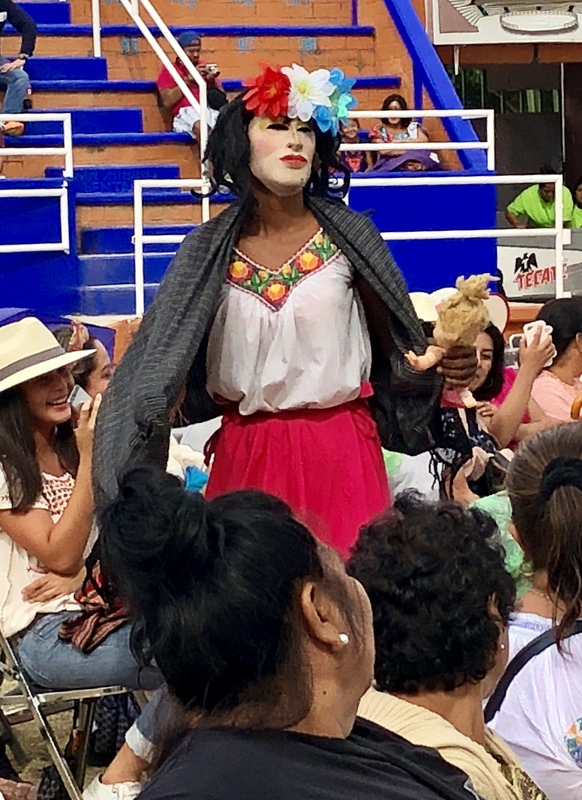 Now referred to as Mexico’s Third Root, people of African descent are an integral part of what it means to be Mexican, more than only the mix of Europeans and AmerIndians. With the conquest of Mexico, Spanish brought African slaves here in the 16th century to work sugar cane fields, mines and agriculture. Most were men and married indigenous women. Race and class was far more permeable in Mexico than in the United States. Only recently have academics and cultural anthropologists begun to uncover and investigate the importance of African roots in Mexican culture. The dance and its music, with its stomping and whirling, are said to symbolize the breaking from the repression of slave owners and the church. The woman in the dance represents the mixing of races. She carries a white doll. Traditionally, the dance is performed on November 1 during Day of the Dead. 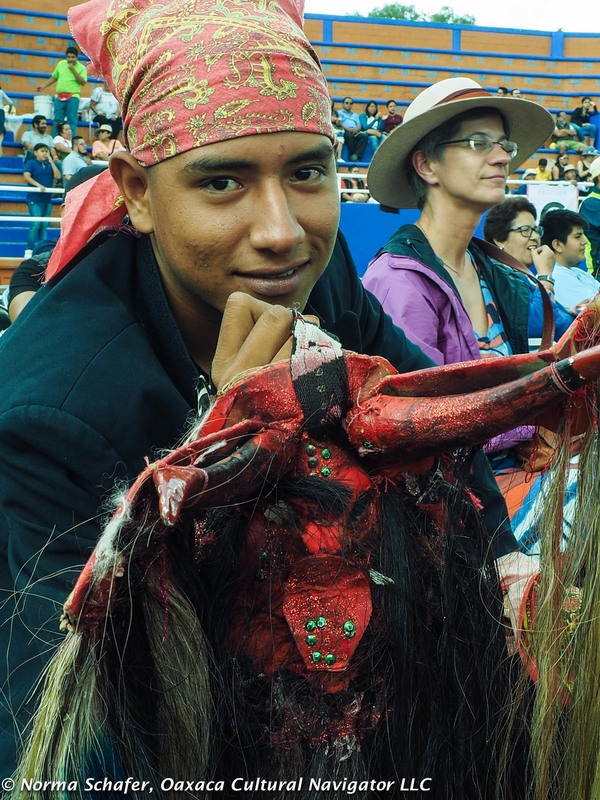 Today, the dance is a testimony to Oaxaca’s rich diversity and deepening respect for her roots. One of the pleasures I have from writing this blog is the research I do to investigate the culture and history of Oaxaca and Mexico. When I was at the Costa Chica in the last two years, I became more aware of African slave roots as as I talked with cultural anthropologists and locals. Much more has been written about the African experience on the Caribbean coast of Mexico, at the port of Veracruz and south. The Son Jarocho music of Mexico, Cuba and the Caribbean are rooted in Africa, as is the donkey jawbone and drum percussion instruments. There is still a lot to learn.